Black Panther is finally here! 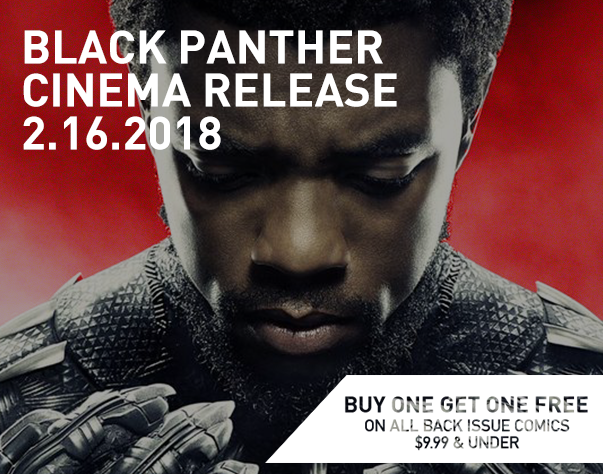 Visit your local Slackers on February 16th to get Buy One Get One Free* on all back issue comics regularly prices $9.99 and under! *The lesser of the items is free. Offer valid only for February 16th, 2018. Some exclusions apply. Sales replace regular Power Card Member offers where applicable and cannot be combined with any other offer. Not valid with trade. Selection varies by location. Some items my be subject to limited availability and/or manager discretion. No dealers. See any Slackers customer service representative for additional information or if you are looking for a specific item.